This is from the IGG Update on 9/9/2017: "We listed the numbers here just to want you know. Although Geek Wave project is delayed but we have solid track records that we will keep pushing until the projects finished. We finish up 13 out of 17 projects. 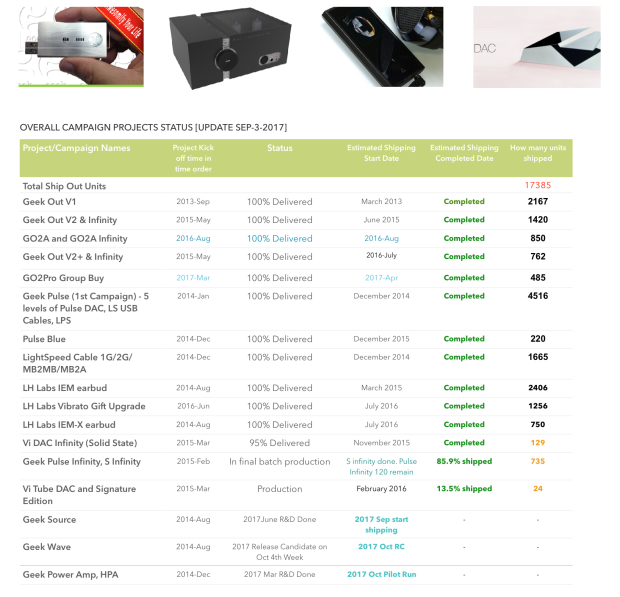 And shipped more than 17,000 units from portable DAC, earbuds, desktop DAC and USB Cables and so on. Due to many practical restrains, we didn’t finish Geek Wave on time. And we have the determination to go through the finish line with your patience and support."